MY NAME IS SAM AND I'VE BEEN A PROFESSIONAL TOUR ORGANIZER: TAXI, VAN, CAR, TUK TUK, AS WELL AS A/C CAR & VAN DRIVER, FOR MANY YEARS, AROUND ANGKOR WAT ARCHEOLOGICAL PARK, SIEM REAP AND BEYOND IN CAMBODIA. Our tour company can arrange a professional English speaking licensed taxi, van, and tuktuk drivers with many years of experienced. 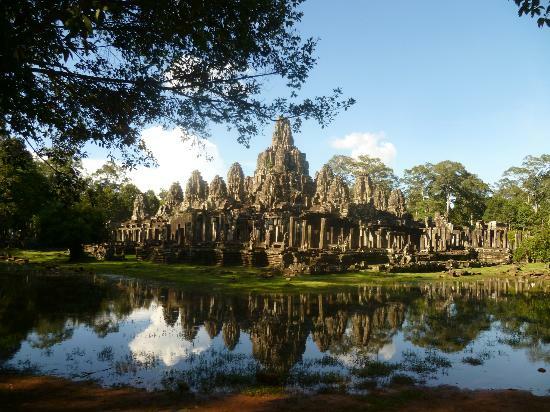 Also we have many professional certified tour guides as well, (licensed from the Ministry of Tourism), to explain the rich history, art, culture, and architecture of the ancient temples as well as daily lives of Cambodian people. (Because the drivers are not allowed to enter in the sites and explain the history of the temples). Note: When visiting the temples please wear some clothing to cover your knees and shoulder, because some temples area has clothing restrictions. 10- Banteay Srei (Lady's or Pink sandstone temple). So if you need any help organizing a tour while you're in Siem Reap, Cambodia, for 1,2,3,4 or even 5 days, with a/c car & van taxi with drivers, tuktuk drivers, certified tour guides, accommodation, bus-boat tickets, please don't hesitate, I want to make sure and help you get the most out of your holidays and have a memorable time visiting my country. There are a few circuits of temples, a small, big, and also an outer temples outlining those circuits, as well as farther out temples. Also there's a countryside tour and taking boat trip to visit fishing community such as floating village, high stilted house, ( about 10 meters high wood & bamboo skyscraper), seeing the daily life of local people and canoeing through flooded forest on the great lake of Tonle Sap Lake, (biggest freshwater lake in Southeast Asia). Recommended: Have a buffet dinner, while watching Cambodian apsara cultural traditional dance show. Nice to wine and dine after a long day of temples touring. 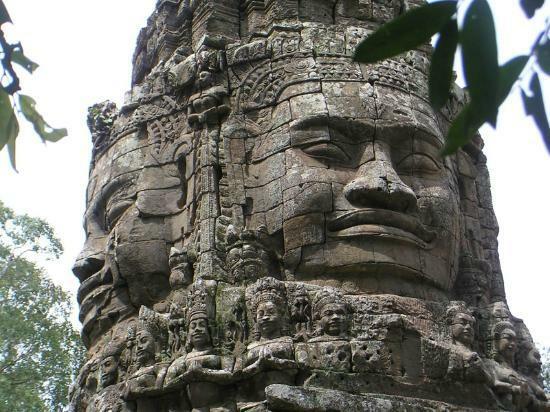 You can ride the elephant from the south gate of Angkor Thom complex to Bayon (smiling face temple). At the kingdom of wonder!!!! © 2012 - 2019 SAM TUK TUK & TOURS. All rights reserved. . .